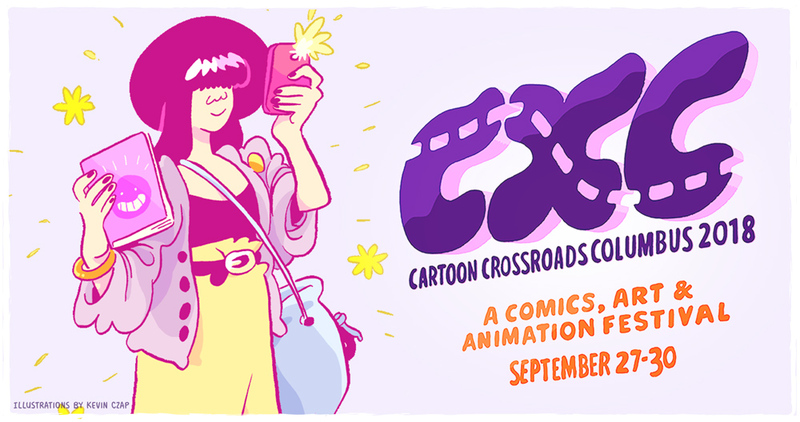 Short Run Comix & Arts Festival is this Saturday, November 3, 2018 in Seattle, WA. 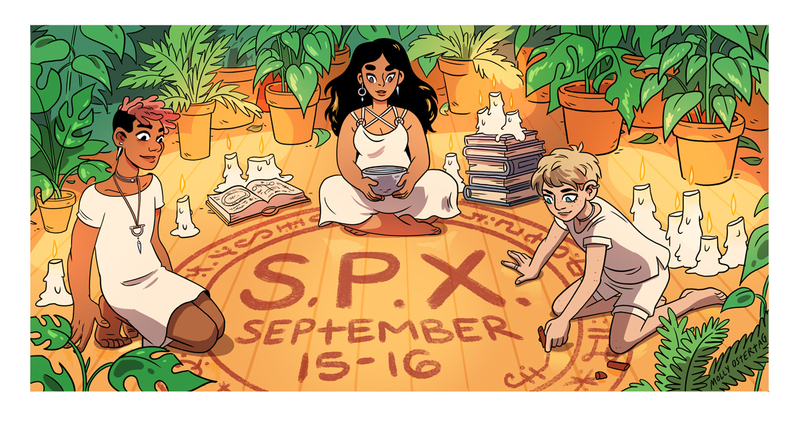 Short Run is a free all-ages event showcasing the best in new and local comics, zines, and more! If you’re in Seattle, be sure to take in this wonderful event from 11am-6pm at Fisher Pavilion and The Vera Project at Seattle Center. For more details, visit Short Run right here. Here is a discussion of what makes for the best comics within the United States with Bill Kartalopoulos, the series editor of the prestigious annual collection, The Best American Comics, published by Houghton Mifflin Harcourt. What does it take to be considered the best? Well, mind you, everyone has their own set of ideas but, essentially, it boils down to compelling work. One way or another, things add up. The work commands your attention and it checks off a number of boxes like being original, structurally sound, and maybe even groundbreaking. One thing that makes this particular interview special is very good timing. I happen to have been in New York for a combination of business and pleasure. The latest collection of Best American Comics had just come out. In fact, I’d recently reviewed it here. So, one thing led to another. I asked Bill what he thought about getting together in person for an interview and so we did. For me, meeting Bill at Parsons The New School for Design was a nice treat. He teaches there on the subject of comics. Currently in his class, he’s covering Art Spiegelman’s landmark work, Maus. Bill was Associate Editor and Production Assistant on MetaMaus, Spiegelman’s 2011 book and multimedia DVD set examining the production of Maus. My goal in this interview was simply to have a pleasant, perhaps even lively, conversation. I am a fan of Best American Comics but I was setting that aside, so to speak, in order to go through a relatively objective set of questions. I wanted to dig around and see what we might uncover and Bill was certainly up for it. What I come away with is the fact that this annual best-of collection has gone through a rigorous process. First, we have Mr. Kartalopoulos dutifully gathering up around 120 or so works that he deems worthy. Then, he hands them off to the guest editor. This year, that honor goes to cartoonist Phoebe Gloeckner. Finally, a shaking and mixing and final rinse. The editor, after paring down the final cut of titles, may end up adding some of her own, and will ultimately preside over a presentation all her own. Okay, lots going on. So, here we discuss all that and more. HENRY CHAMBERLAIN: Bill, I thought we could take as our jumping off point the last work in this year’s Best American Comics. This is by Lale Westvind. It is quite a surreal sci-fi tale entitled, “Yazar and Arkadaş.” I think it would be good fun to linger over this loopy and wonderful work, an ideal example of what comics are all about. It kicks off with an urgent search for a book and, along the way, the main characters are compelled to continue their journey naked. What can you tell us? BILL KARTALOPOULOS: Lale Westvind did the cover for this year’s Best American Comics. This piece was one that she published during the twelve month cycle that we cover for each volume. Our excerpt doesn’t contain the story in full but it gives the reader a good sense of it. The original work was published on a risograph. We attempted to evoke that same look and feel, including the pink paper used in the original. CHAMBERLAIN: That unique look that you get from a risograph is part of what defines independent comics. KARTALOPOULOS: I think a lot of Lale’s work speaks to science fiction. Although a lot of her work is very different, it does bring to mind Jack Kirby and how he played with mythology with his New Gods. 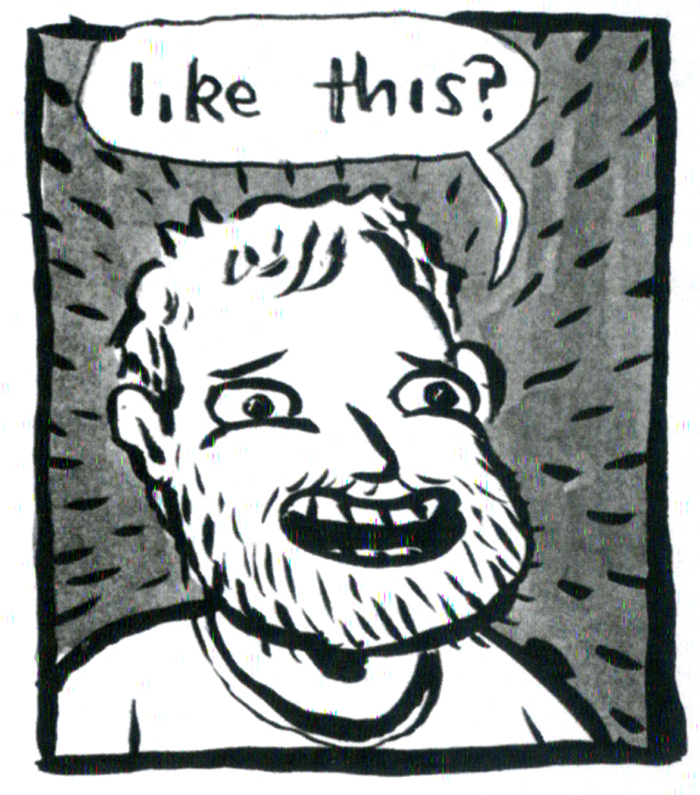 Something else that I think is really nice and speaks to the selection process is what happened when it came time for Phoebe to pick what to excerpt from Emil Ferris’s My Favorite Thing is Monsters. She chose a conversation that refers to Medusa. That moment would end up resonating at the end of the book, with the last work by Lale Westvind and her disembodied head of Medusa with the tendrils of hair acting as arms grabbing at things. CHAMBERLAIN: It happens every year. I recall us talking about interconnections between the selected works during our phone interview a few years back. KARTALOPOULOS: It’s not a heavy-handed thing. CHAMBERLAIN: Oh, of course not. KARTALOPOULOS: It’s something you can’t force. It’s natural and organic. CHAMBERLAIN: I think of how iconic My Favorite Things is Monsters is for readers. To present it in this collection, the challenge was to find an interesting way to revisit. Maybe you could give us another look behind the scenes. What is the significance of having Gabrielle Bell’s piece as the opener? KARTALOPOULOS: That’s an interesting question particularly with how it relates to the creation of this collection. Each new guest editor handles the job a bit differently. For example, Scott McCloud created categories and wrote short introductions for each. Jonatahn Lethem, the next year, aware of what McCloud had done, followed suit in his own idiosyncratic way.This year, with Phoebe Gloeckner, she decided to see what it might look like with alphabetizing the titles–which is exactly what she ended up doing for the book! CHAMBERLAIN: You can’t be any more fair than having the book alphabetized! That’s a good tip for aspiring cartoonists. Get a pseudonym that places you towards the front. I’m looking at Tara Booth’s work now. It’s a very raw and powerful style. And then you’ve got, after that, the very lean and clean work of J. D. Bryant. Some of the elements in Tara’s work are very challenging for the viewer. While, with Bryant, it’s very cool and detached. Maybe we can do a bit of comparing and contrasting with these two. KARTALOPOULOS: Sure, these are two very different ways of working. I certainly hope that it demonstrates the wide variety of work on display in these pages. Tara Booth shares with the reader the more private aspects of life, things you wouldn’t typically share, like popping a zit. She works mostly, if not exclusively, in gouache for this piece. Bryant works in the tradition of alt-comics from the ’80s and ’90s. It’s a naturalistic style with pop appeal, very dense, with a surreal narrative that loops back on itself. The types of brushes and pens and inks he uses go back further to the ’30s and ’40s. Booth has a very different approach, wordless little moments. Both are extremely effective styles. CHAMBERLAIN: It does take a lot for a major comic book publisher to appear in Best American Comics, doesn’t it? It happens from time to time. This year we have a piece by Geof Darrow that appeared in Dark Horse Comics. I understand why that is. A lot of the work is market-driven and would seem out of context in Best American Comics. That said, I see a lot of interesting work coming out of Image Comics, for example. Is it a case of stepping back from the major comic book publishers in order to secure room for the independent cartoonists? KARTALOPOULOS: We don’t really think about the scale of the publisher necessarily. We’re just looking for good work, something that is unique that expresses a personal vision, not necessarily an autobiographical vision. Dark Horse does publish a good amount of creator-owned work. This piece by Geof Darrow is very much an auteurial work: it is his vision; he is doing the work just the way he sees it. This is a personal vision regardless of the means of production. It is a personal vision as much as the work just before it, a self-published piece by Max Clotfelter. CHAMBERLAIN: I agree. This brings us back to our theme of different approaches. One piece is technically crisp and another is stripped down. I want to ask you to share with us something about your intimate connection with comics. I know you spend quite a lot time on comics in various ways. Would you give us a window into your day or whatever you might like to share. KARTALOPOULOS: I teach at Parsons about comics so at least once a week I’m teaching. Then I’m either preparing for a class or grading papers. I just finished reading for Best American Comics 2019. Each book has a time lag. For example, the current volume covers work created from September 2016 to August 2017. It goes from Autumn to Autumn. Then it takes a full year to create a volume. I’m at a place right now where I’m about to hand off work to our next guest editor. At the same time, I’m working on a book on North American comics for Princeton University Press. It’s pretty far along but I still have a number of chapters to complete. 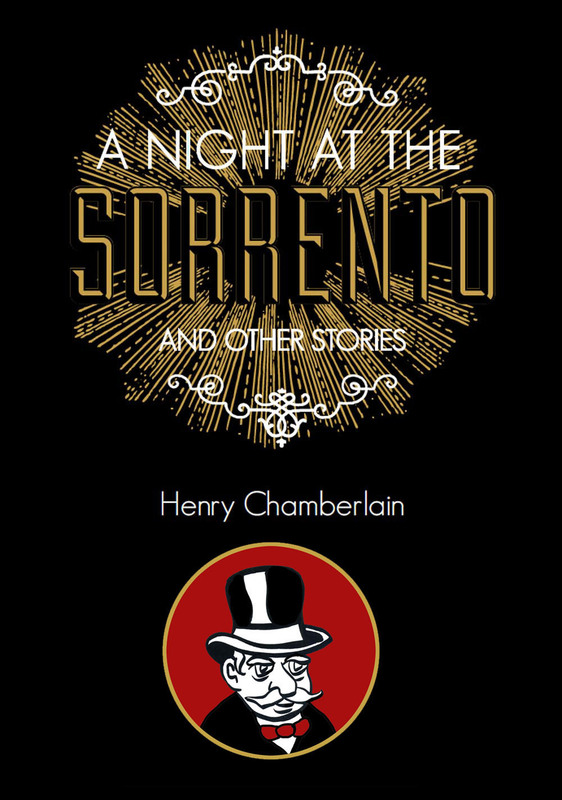 CHAMBERLAIN: How do you gauge the reception that the book gets. With each year, do you sense that you’ve got a locked-in audience? KARTALOPOULOS: The print run is somewhere around 20,000 copies so that’s a lot of copies out in the world. One thing that I think is very helpful is that the series tends to fairly automatically enter libraries. I think this series has a pretty useful life as an entry point into comics for many readers. We put as much information as we can about the sources of each title. We have bios and websites. So, for example, if there’s a self-contained work among the selections, maybe readers will seek out that creator and read more. In this way, we can make a quite impact well beyond the initial release of a volume. CHAMBERLAIN: You’re talking about a quiet impact. You’re not exactly thinking in terms of setting a standard–or maybe you are, to some degree? KARTALOPOULOS: I think we’re seeking out good comics. I’m putting together a larger pool of material, over a hundred pieces, for the guest editor. I select work worth considering…really give the guest editor a lot of options. Really select pieces that are meaningful to them. I try to give them a broad palette. The guest editor is applying their own sense of critical judgement of what they consider a good comic. If you look at the series from multiple volumes, you’ll see a consistency, a pretty high level of quality. A mark of success for the series is how each guest editor leaves their personal mark. This year’s volume, edited by Phoebe Gloeckner, feels different to me to the volume edited by Ben Katchor, which feels different to me to the volume edited by Roz Chast, and so on. There’s consistency, a high level of quality, and each guest editor brings in their own point of view. CHAMBERLAIN: That’s a wonderful place to end. Thanks for your time, Bill. You can visit Bill Kartalopoulos right here. Mastering the “Uncomfortable Smile.” Who knew that was a thing. Apparently, it is a very big thing among cartoonist Sam Spina and his friends. Seriously, Spina is masterful at spinning gold from ephemera. It’s an art form that carries over to all kinds of storytelling. So, it makes total sense that Spina could transfer the skills he honed as a cartoonist and use them as a storyboard artist for Cartoon Network’s “Regular Show.” Spina has a golden touch which you can enjoy in his latest collection of diary comics, “Spinadoodles #8: Mooz Boosh,” available at Kilgore Books. The whole page about uncomfortable smiles. 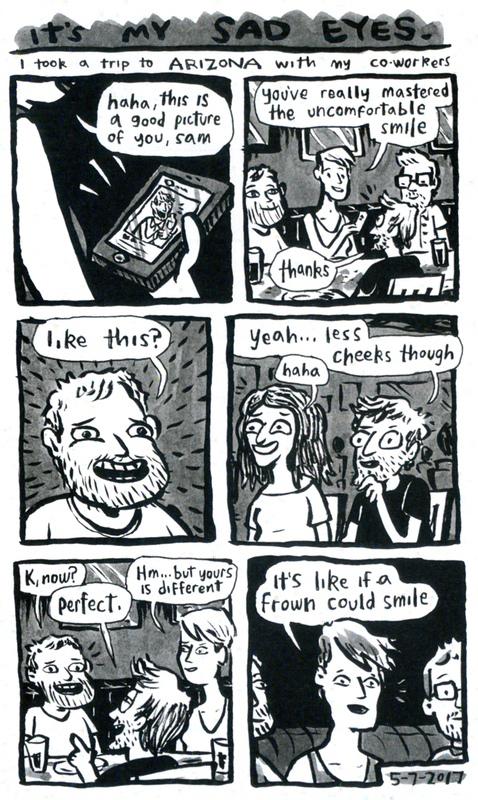 The whole page about uncomfortable smiles, entitled, “It’s My Sad Eyes,” is fun to read and indicative of what you’ll find here. Spina is recalling a moment from a trip to Arizona. The locale is mentioned simply to add a little flavor. The focus is on the interactions between friends. Spina uses a very casual approach which welcomes the reader. Everything feels like it is accessible and evoking an easy-going conversation. Nothing appears to be overworked. The characters are drawn, not in a slapdash manner as much as a slapdash style. That’s a huge difference. Less careful, less thoughtful, and less skilled cartoonists tend to lean too heavily upon an artistic sensibility that would embrace any mark on the page. In fact, any mark on a page is not golden. There are standards to this thing and cartoonists that create comics at the level of a six-year-old seeking praise from grandma are doing themselves a disservice. Just saying. 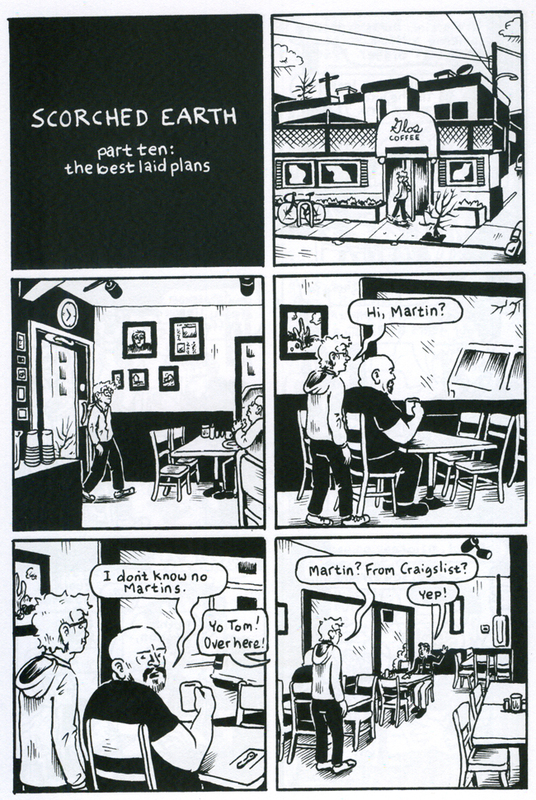 Diary comics actually have a long history, inextricably linked to independent comics. And it is John Porcellino’s ongoing zine, “King-Cat Comics and Stories” (May 1989 – present), that casts quite a long shadow. I think there is room for everyone under the comics tent–and I know a lot of cartoonists are influenced by John P’s approach, be it the pared-down artwork, the spare compositions, right down to the self-deprecating humor–but it often does not quite work in other hands. The best one can do is to honor what he’s established and add to it. I think Sam Spina falls within the group of cartoonists that are not just coasting along but creating compelling work. Sam Spina is having fun and he has taken the time to give his comics a distinctive charm and sparkle. His humor is not particularly satirical as much as it is in keeping with the slice-of-life tradition of much of alt-comics. Within alt-comics circles, authenticity is highly regarded although not always followed through in practice. Spina’s work has a refreshing honesty and irreverence that, at its best, can rise above anything trendy and cute and just be plain ole good storytelling. 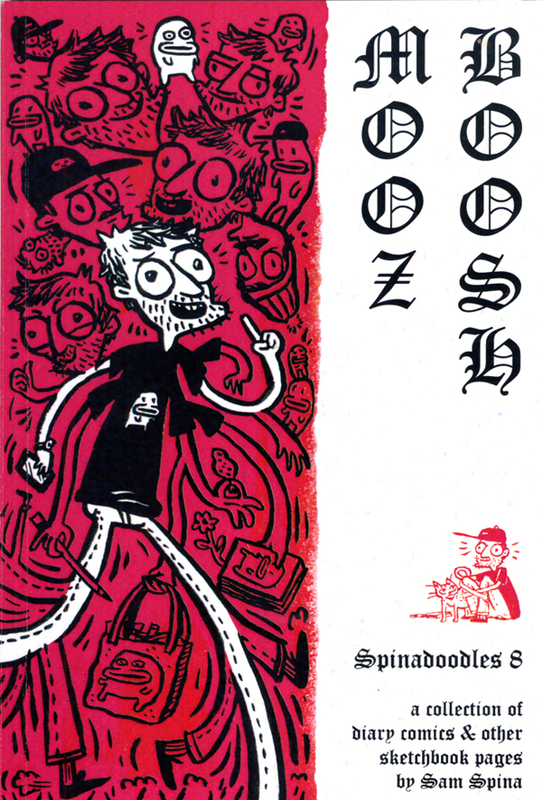 “Spinadoodles #8: Mooz Boosh,” is available at Kilgore Books. 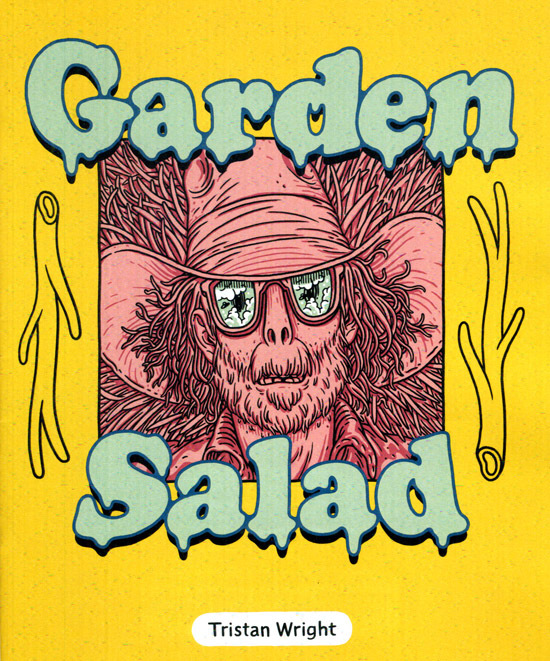 “Garden Salad” is a mini-comic that exceeds expectations and enters the realm of a model of excellence: the story is engaging; the art has a dazzling and quite intoxicating quality; the whole work is delightfully original. Tristan Wright is new to me but I’m so glad that I stumbled upon his work! Honestly, the solid craftsmanship and originality immediately won me over. Creating something with a real spark and kick to it is never easy. What Wright accomplishes with this work involves a lot of groundwork and revisions. I suspect that he enjoys every bit of it as there is an effortless and joyful vibe throughout these pages. Nice day for some sveedle! Our story is a deceptively simple one: an old man is gathering items from his garden for his mid-day feast. Like many stories that have the reader see things from an unconventional vantage point, events focus more on what the old man is foraging: vegetables, for sure, but not good ole veggies exclusively. How about a veggie goblin? In our tale, we see quite a bit of this little critter and then we come to find out that the old man is all too aware of this bewildering force of nature. He even has a name for them. These critters are known as “sveedle.” Sounds like something out of a Stephen King novel! Yum, sveedle, them’s good eatin’ goblins! Running after the garden goblin! Yessir, these here goblins are pretty hideous and intense little beings. With a wedge of leaves upon their heads and bulbous jiggly bodies, they resemble what they eat: veggies, but also worms and other creepy crawlies. The big hint here is that these ghastly little monsters are violent–and potentially dangerous to humans. But the old man seems to be up to the challenge. In fact, the old man is relatively hideous and dangerous in his own right, surely a formidable match for any veggie goblin. Wright’s intricate and detailed drawing style keep the reader glued to each page. This is a masterfully crafted tale with a philosophical bent; a wonderfully ambiguous tale of veggies and goblins. Let’s go ahead and bring out a nice shiny star and give this one a 10/10. 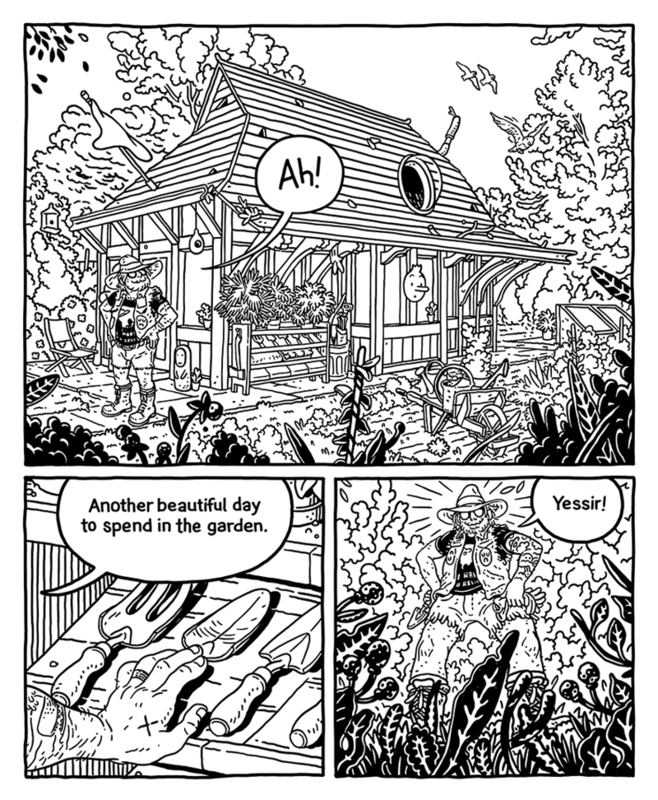 “Garden Salad” is a 32-page black and white comic book written and drawn by Tristan Wright. For more details, and how to purchase, go right here. On a recent trip to Tacoma, I went to visit my dear friend, Dalton and his family. Our first stop was Tinkertopia. Dalton said it was just the place to go and he was so right. This place has everything in the way of quirky and functional art supplies and curios and such. Well, there’s a very practical and worthwhile side to this. 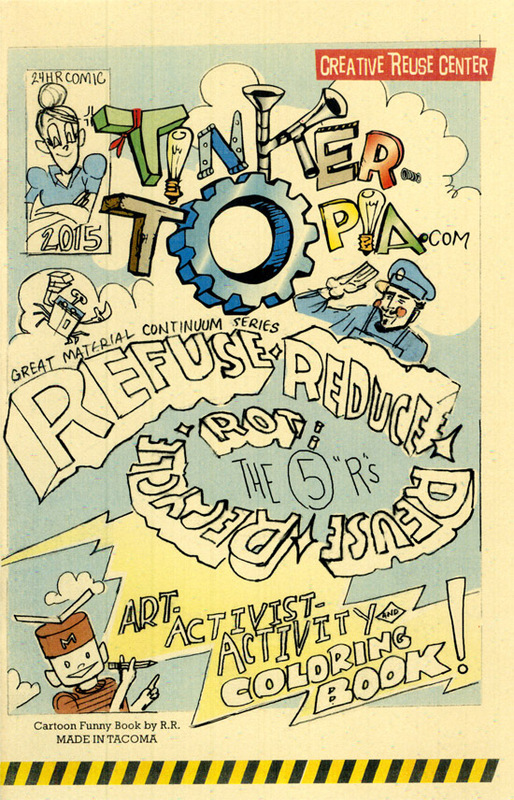 Tinkertopia plays a vital role in the community as it is in the forefront of the reuse and do-it-yourself movement. Much of what is on display and for sale has been salvaged and recycled in some way in order to enjoy a new life as alternate artwork and arts & crafts supplies. Tinkertopia is also a prime location for workshops of all kinds, especially for kids. As a cartoonist, I was quite taken with the mini-comics on display which, after a closer look, were the results of numerous 24-Hour Comics Day marathons. I am something of an expert of 24HCD, I suppose, as I’ve been creating comics during that event for a number of years. It’s always fun to see what comes from these comics experiments. The merry band of cartoonists that congregate at Tinkertopia enjoy a perfectly built-in ecosystem for such endeavors. The books on display are by R.R., that’s short for Rerun (aka RR Anderson), the master of ceremonies at Tinkertopia. A fine and dandy drawing style by Rerun! 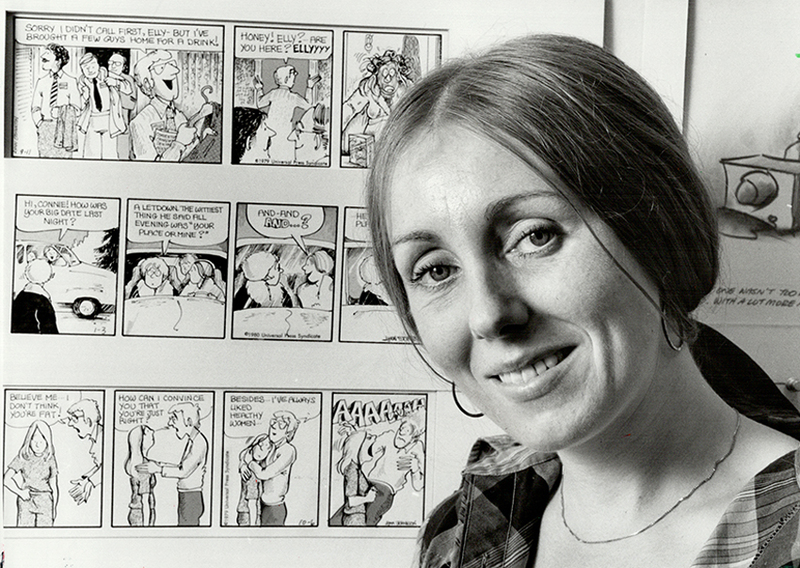 Many comics fans, young and old, are familiar with Rerun’s cartooning antics which feature the Hairy Mermaid. Rerun has as a clean and polished style. His sense of humor is highly irreverent and just a lot of fun. Rerun’s fluid line makes it all looks effortless and graceful. 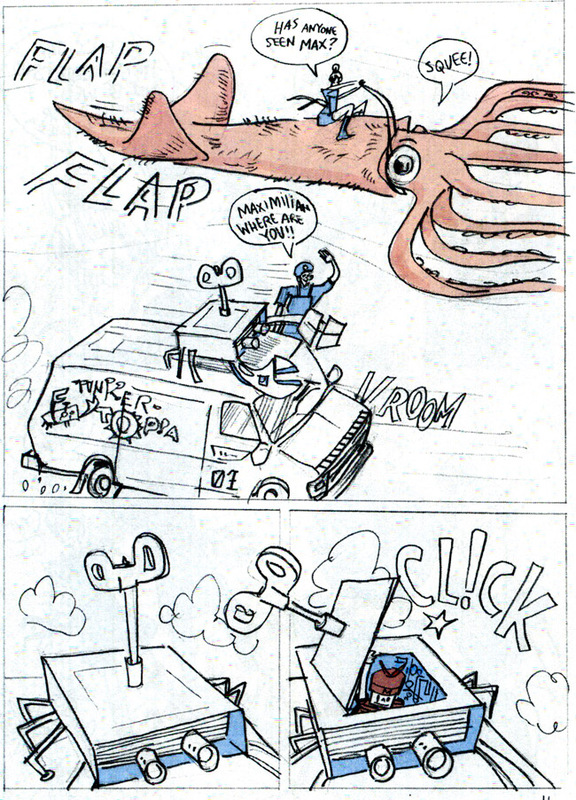 But I can see that he’s put in the elbow grease necessary to have a facile way with drawing trucks and squids flying through space from one panel to the next. A nice crisp style like Rerun’s comes from dedication and a genuine tireless love for the comics medium. If you have a young inventor in the family, or want to throw a unique birthday party, or maybe need help with recycling, come to Tinkertopia. Founded by two Tacoma artists, Tinkertopia is all about resource conservation in partnership with local industries, educators, and activists. There’s always something on to inspire and to educate. In March, for example, you can take part in a workshop to build Tiny Treehouses and Leprechaun Lairs! There are numerous workshops and events at Tinkertopia that will have something for everyone. Go visit Tinkertopia right here. And one final note: You want to know more about RR Anderson? Well, he’s the real deal trifecta: a cartoonist, inventor, and author. 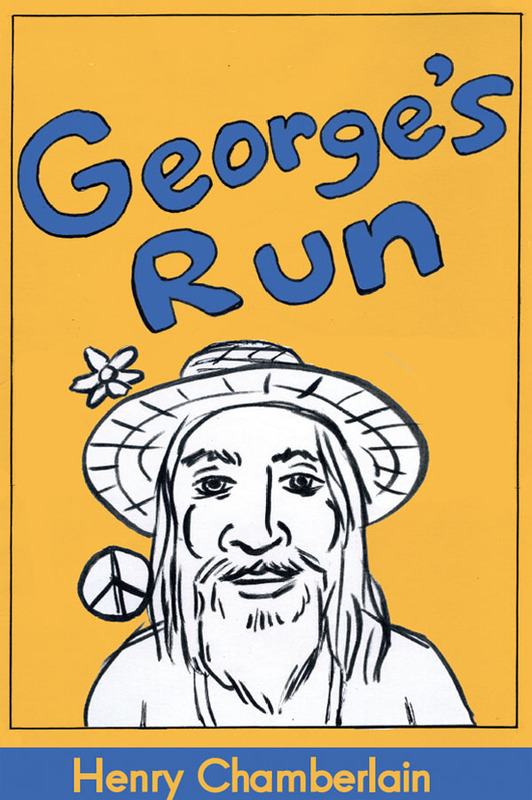 Check out his book, “The Tacomic.” As he puts it himself: “RR Anderson is one of the most curious alternative political cartoonists in FeedTacoma.com history. He fought bizarre underground beings in the lava tubes of Juneau, Alaska; was wounded by a laser before it was invented; and was a founding father of the Cartoonists League of Absurd Washingtonians (C.L.A.W.). Questions? Seek him out drawing on the sidewalk at Friday’s Frost Park Chalk Challenge in the center of downtown Tacoma. Ultimately his work is about friendship, need and other timeless values.” Visit RR Anderson right here. 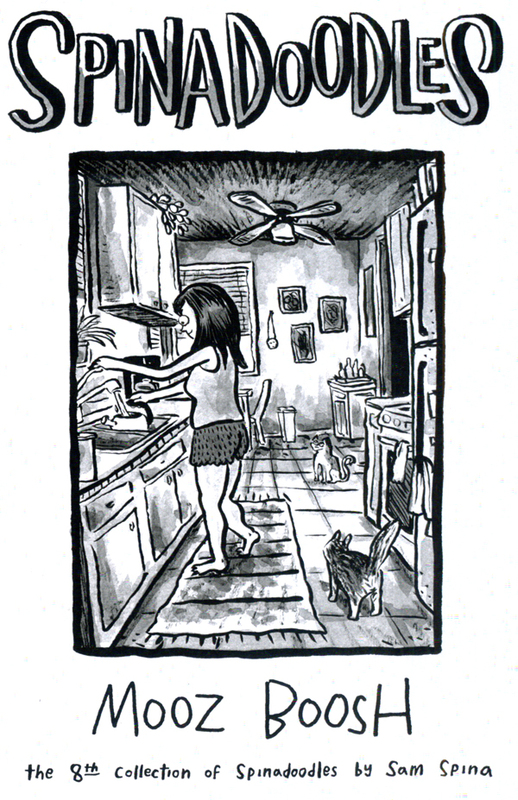 For a sampling of some of the best independent cartoonists today, one great source is the NOT MY SMALL DIARY anthology, edited by Delaine Derry Green. 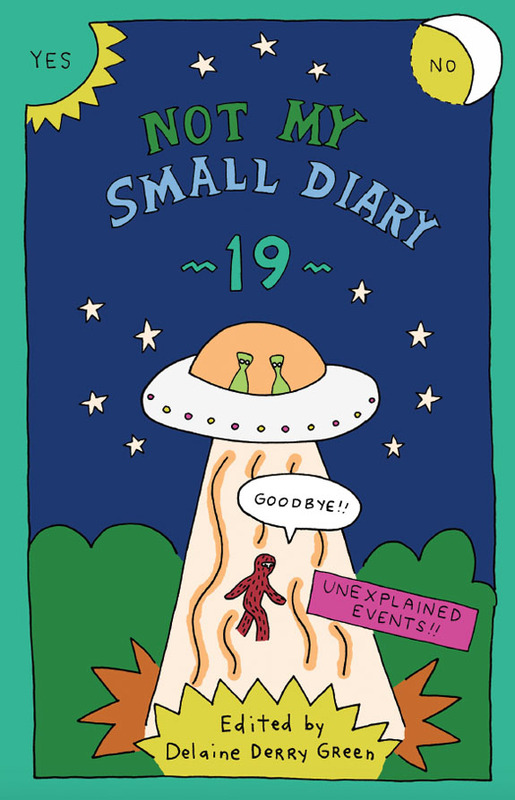 Cartoonist John Porcellino, known for his “King Cat” comics, has called Delaine’s anthology, “One of the most important comic-zines in history.” Here is a look at Issue 19: Unexplained Events, which showcases the work from 43 talented artists. So, the theme of “unexplained events” leaves open a wide field of opportunities from things that go bump in the night and beyond. One of the most inventive, jarring, and downright entertaining pieces comes from Kevin Van Hyning. It’s a pretty messed up misadventure and I hope and pray that nothing close to this actually happened to Kevin. Like a lot of creative people, myself included, Kevin has many outlets, like performing on stage. In “The Curse of Macbeth,” we see what can happen when an actor confronts the age-old superstition of daring to say “Macbeth” before a show. It’s supposed to be very bad luck! And, as it turns out in this comic, it’s the sort of bad luck that can knock your teeth out! Inspired work! A big takeaway for me is learning of this curse as I don’t believe I’d ever heard of it before. But it has a long tradition dating back to the very first time it was performed in 1606. Teeth kept being knocked out and worse! As a cartoonist myself, who has observed and commented upon the comics scene for many years, I am delighted to see page after page of inspired work from familiar and new talent. What you find in this book is a treasure trove of comics experimentation. Each creator is working within their own special confines, powered by their own personal engine. This is a fascinating book and a must-read for anyone interested in contemporary comics. Each artist you visit here is like a little island onto itself. We paddle ashore and reach the Isle of David Lasky. Here we find enigmatic work giving out a melancholic howl. 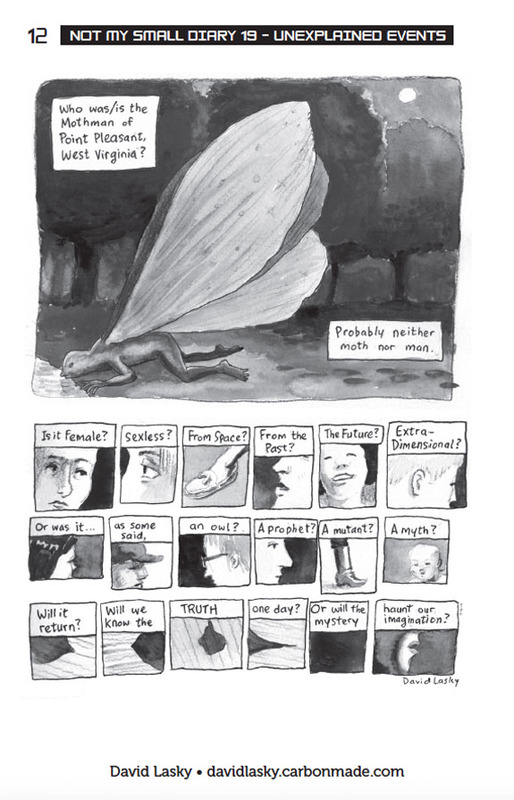 In the one-page “Mothman,” we find the distinctive Lasky poetic comic. Relax your shoulders and linger over it. The universal symbol for the unexplained seems to always go back to UFOs. And so I close with a piece by James Burns, “My ‘Unusual’ Sighting.” The most eerie and creepy incidents are beautifully underscored by the mundane. Often the most profound things must compete with the most banal and so it is in this comic. 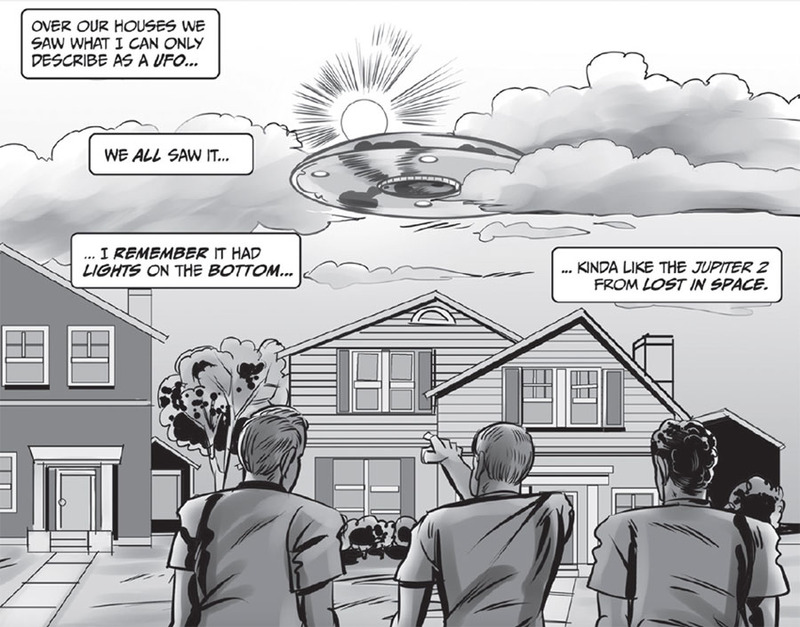 It is 1966 and a bunch of kids innocently look up in the sky and seem to be watching their favorite sci-fi show in the clouds–but they’re not. Or what are they seeing? Ten years later, Burns is eighteen and has an opportunity to possibly confirm his most wildest speculation. But he’s still a kid–and what is he supposed to do if his suspicions are correct? Nicely done and a fitting example to a most impressive collection of work in comics. Be sure to keep up with Not My Small Diary at Delaine Derry Green’s My Small Web Page right here. A wretched staleness in the air. Lost souls strewn about. And it’s all played up for laughs! Welcome to the wonderful world of cartoonist Tom Van Deusen. I really admire Tom’s style, in person and in his comics. Tom is a very likable and professional gent. So, it’s a unique treat to then read his comics featuring Tom’s vile and hateful alter ego. I reviewed a couple of issues of his Scorched Earth comics. You can read that here. This new collection, published by Kilgore Books, that came out this year simply goes by the same running title and contains a fine mix of old and new material. You will want to seek this out. Tom Van Deusen’s aim is to satirize the oily underbelly of hipsterdom with a neo-underground sensibility. 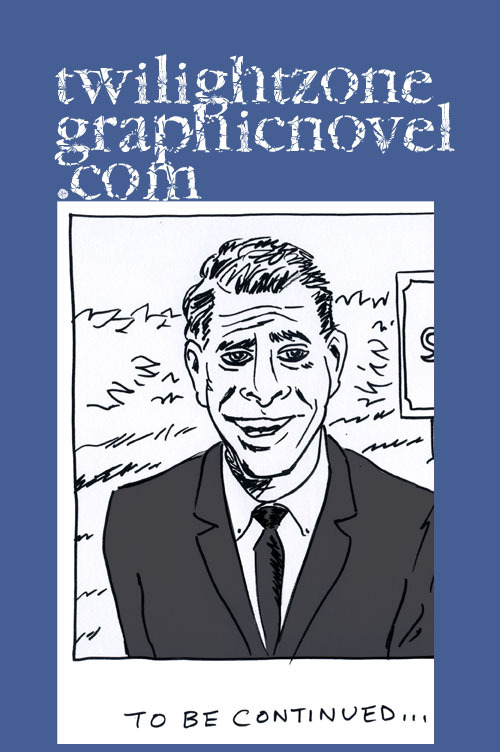 His characters traffic in a Robert Crumb-like netherworld where hedonism and arrogance commingle. 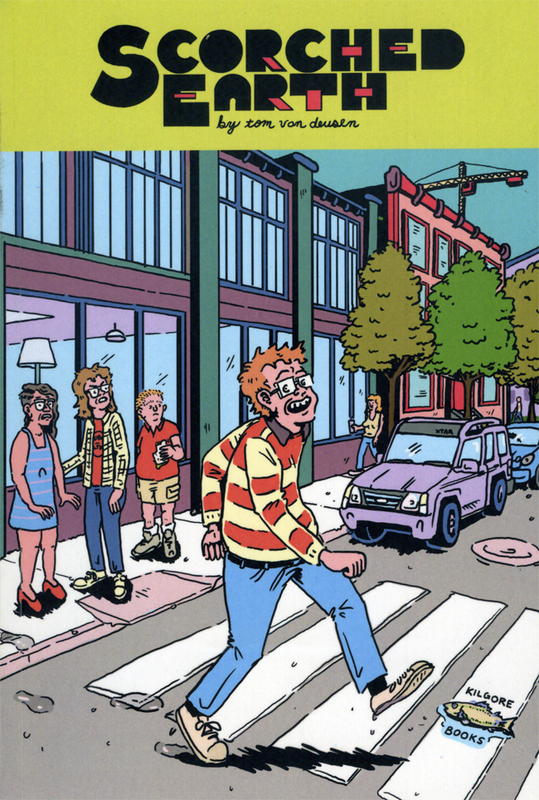 Like Crumb, Van Deusen is both fascinated and repulsed by the hipster zeitgeist. Van Deusen’s alter ego, Tom, struggles to connect with a woman who is willing to sleep with anyone…except him. She’ll even sleep with his doppelgänger but not the original. Tom can’t even get a handle on the e-cigarette craze that all the “cool kids” have latched onto. For Tom, vaping does not involve a slim little gadget delivering dramatic puffs of vapor. No, for Tom, it involves a monstrous contraption that looks like an iron lung. 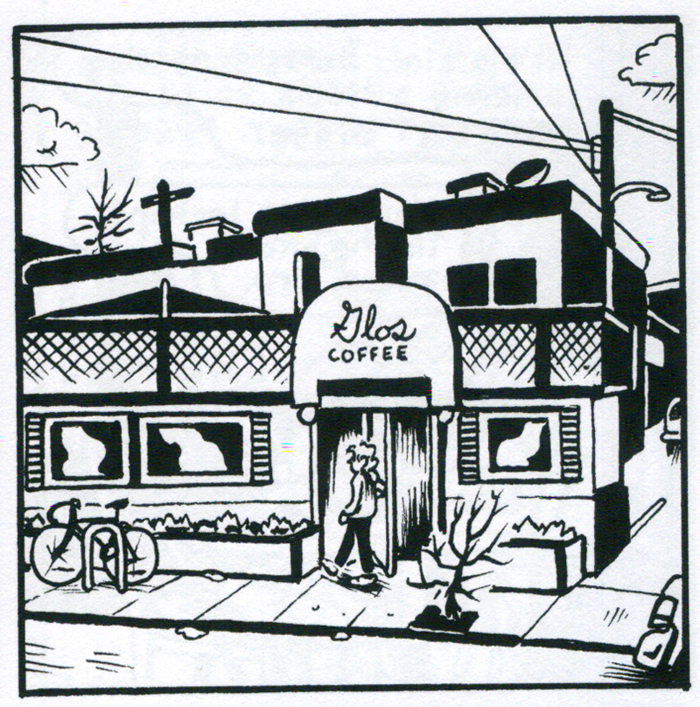 One of the best bits in the book takes place at Glo’s Diner, located in what is the Capitol Hill district of Seattle, a densely populated area and a counterculture mecca. I curated art shows at Glo’s Diner for five years and presented work from local cartoonists including David Lasky, Ellen Forney, Jennifer Daydreamer, Farel Dalrymple, and myself. It is a small space. The food is okay. But there is something about that peculiar little oily spoon that reads authentic. It’s great to see a cartoonist of Van Deusen’s caliber pick up on that. He takes his time to capture the place’s true dimensions and spirit. The not so sweet young things remain out of reach for sad sack Tom. He remains on the fringes of the fashionable fringe element. The beauty of it all is that Van Deusen dares to keep vigil, take notes, and then pile it all into a blender and create some very funny comics. Visit Tom here, find his comics at Poochie Press right here and find this recent collection of SCORCHED EARTH at Kilgore Books & Comics right here.